We really wanted to like Genius Test in our review. In some ways it really shines bright but it feels like they tried so hard to be “different” while still maintaining the “status quo”, they lost out on what could have made them “better”. Trace Minerals: Boron (probably the single most important mineral to supplement with for testosterone production due to it severely lacking in most diets). A really high (1,000 mg) dose of Ashwagandha/KSM-66 is impressive. ⇒ Ashwagandha is one of the best herbs for promoting natural testosterone production. It helps decrease stress and get a better nights sleep. Both extremely vital for maximising your T.
⇒ Longjack is another fantastic herb to boost your testosterone and Genius Test goes all out with the ultra expensive LJ100. While I love longjack as a test booster and the 100mg in Genius Test is great, there is a caveat here! Is LJ100 (a 100:1 extract) really better than standard 100:1 Longjack? Probably not but it will cost you a lot more money! LJ100 costs A LOT of money and is based on a standardized extract of 40% glycosaponins, 22% eurypeptides and 30% polysaccharides. That looks great for marketing purposes but what does it really even mean? While going into the science behind it is out of the scope of this review, “you can debunk yourself the pseudoscience of “40% glycosaponins, 22% eurypeptides and 30% polysaccharides”.” by reading more about it here if you choose. In short though, in my opinion you are really being charged a lot more money for basically the same thing you get from a standard 100:1 longjack extract as long as you are buying from a reputable source. Genius Test uses Primavie which has a very high reputation for the safety in the manufacturing of their powdered shilajit. 500mg is a very generous serving size (compare to 50 mg in Vintage Boost). Real shilajit is expensive to source and manufacture. 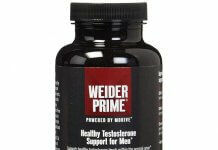 Studies shown a testosterone boosting benefit with as little as 200 mg daily and studies tend to give higher than needed doses as they are looking to prove effect not find the minimum dose required for benefit. Therefore, I don’t personally believe you will get an added T increase by upping the dose to 500 mg but it will cost you more for such a big dose. However, shilajit is very good for your overall health and the additional mg’s are not going to hurt you by any means. While PrimaVie has at least in the past put a lot of work into testing for safety of their shilajit, there is something I really don’t like about their product. I have no idea what the fulvic acid content is! Fulvic acid (FA) is a big part of what makes shilajit so great and it is pretty standard for reputable manufacturers to list what percentage their FA is. But I couldn’t find that information on PrimaVie (manufactured by Natreon INC) anywhere online. 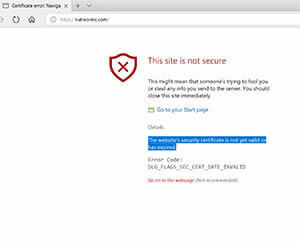 I attempted to go to their website but it is down because they do not have a valid SSL certificate. But the phone number went to a busy signal and that raises a huge red flag for me! You would typically think the higher the FA content the better since so many manufacturers tout upwards of 60% Fulvic Acid in their shilajit but the opposite is actually true. Natural, pure shilajit contains around 4 – 6% fulvic acid. While the fulvic acid percentage will go up when turning the resin into a powder, the less is actually better. Fulvic acid is great for your health but it is just one small part of what makes shilajit such a wonderful nutrient. Read my full write up shilajit and testosterone. Companies often “cut” their shilajit with added FA to reduce costs. The more fulvic acid you add to the shilajit the less nutrient benefit you get from the natural product. However, FA is cheaper to manufacture and therefore the more you add to your shilajit the higher the profit margin of the company selling it to you. That is why it is so important to understand how much fulvic acid you are getting in your shilajit. Quercetin is a good nutrient with a wide range of health benefits and supplementing with quercetin in dihydrate form, is the most bioavailable, which is what Genius Test uses so props to them for that. While no human studies have been directly linked to a boost in testosterone, Quercetin appears to inhibit an enzyme called UGT2B17 which converts testosterone into a molecule known as testosterone glucuronide. Testosterone glucuronide is excreted via the kidneys and your urine. So it would seem that supplementing with quercetin may help keep more of your testosterone in your system which is great. The problem we have with quercetin in Genius Test, is there is only 250 mg of it. We have not seen a human study yet where less than 500 mg of daily supplementation was used effectively and in most cases it was 1,000 – 2,000 mg. In short, we like quercetin and think it is a great supplement to take. However, we are not sold on achieving any real benefits from just 250 mg. We feel it would be better to take quercetin as a standalone supplement. ⇒ Where Is It Made? We don’t know where it’s manufactured or if it’s in an FDA or GMP certified facility which usually means it is not. That’s always a little scary considering the supplement industry’s reputation for cutting corners. Considering the large doses of Ashwagandha, Shilajit and Longjack which are all on the expensive side to manufacture, it is a valid concern. Fenugreek Extract – Is used to treat menopausal symptoms, induce childbirth, and increase the supply of breast milk in lactating mothers. Why is it in so many T-Boosters on the market today? 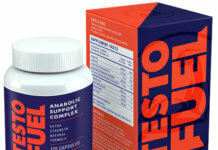 Because of a patented extraction method called “Testofen” which used “in-house” studies to try and validate it as a miracle testosterone booster. We have yet to find a non-sponsored study on either Fenugreek or Testofen showing any improvement in T levels but there are a lot of studies showing no increase. Diindolylmethane (DIM) – There is a lot of hype around DIM but to date the human studies have varied greatly with little to no evidence supporting claims of a testosterone increase. I believe when you consume DIM in its natural form from cruciferous vegetables it’s health benefits and estrogen blocking capabilities are wonderful. Maca root is actually a cruciferous vegetable and has some of the highest quantities of DIM of any vegetable known to man. However, in supplement form the science backing DIM’s abilities is clearly lacking. In fact, there has been evidence showing supplementation may actually decrease testosterone in humans while in rats it has been shown to lead to histological degeneration of testicular tissues which is something you obviously don’t want. Lastly, DIM in supplement form is frequently used to treat postmenopausal women. While a nutrient can certainly have multiple benefits and can react differently in men than women, in this case it just leaves yet another question mark as to what Genius Brand was thinking adding it to their T booster. Overall we applaud the effort by Genius Brand for trying to put together a unique product and quality product. It seems as if they added Fenugreek and DIM to not stray too far from the “popular in the moment” crowd though and there just isn’t enough quercetin to get us excited. As you know if you’ve read our articles on Fenugreek and DIM, I am not a fan of either supplement and suggest to stay away from taking them. I also don’t like that I don’t know where it is made and it does not appear to be made in either an FDA or GMP registered facility. It’s also expensive going for $57.95 a bottle on Amazon. With all of that said Genius Test still has a lot going for it as they clearly put a lot of time, effort and money into building this product out. The amount of ashwagandha (KSM-66) and shilajit in it alone command respect in terms of the dollars they put into manufacturing each bottle. Unfortunately however, that cost is inevitably passed down to you. 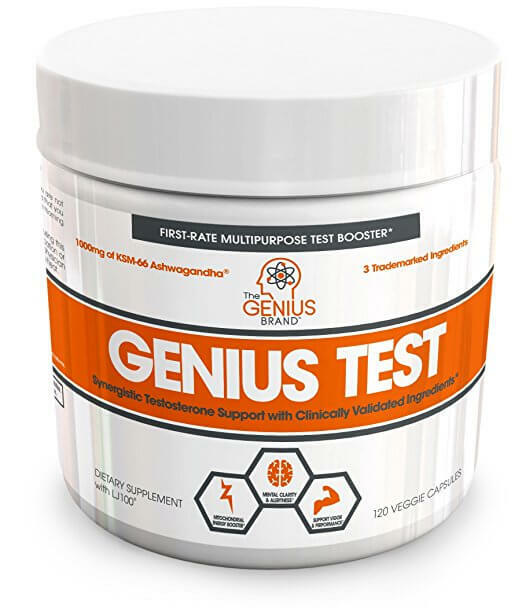 In the end, if you are going to take a testosterone booster with fenugreek and DIM, and you can afford it, Genius Test is certainly a product worth trying. However, I suggest you read our articles on fenugreek and DIM first! It features both Ashwagandha and Longjack as well as other high quality science backed ingredients. And its price won’t burn a hole in your wallet! Overall I applaud the effort by Genius Brand for trying to put together a unique product and quality product. It seems as if they added Fenugreek and DIM to not stray too far from the "popular in the moment" crowd though and there just isn't enough quercetin to get us excited. 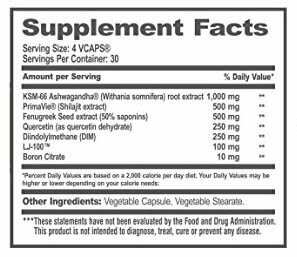 I do have to give them serious credit though for going all out with high doses of Ashwagandha (KSM-66) as well as shilajit (even though I'm not too sure about primavie since I can't get fulvic acid information about it). Both of those ingredients are top notch and while I feel LJ100 is a expensive version of longjack 100:1 but pretty identical in quality, they still include the "premium" version in Genius test. Genius test is very expensive for sure, but they did put a lot into the product so I would say it is priced fairly considering their cost to manufacture.